13 Above: Degos Disease...Extremely Rare Vasculopathy !! Degos disease (also called malignant atrophic papulosis) is an extremely rare vasculopathy that affects the lining of the medium and small veins and arteries, resulting in occlusion (blockage of the vessel) and tissue infarction. The disease is named for Robert Degos who recognized it as a clinical entity in 1942, after it was first described by Kohlmeier in 1941. Degos Disease seems to be a disease of the blood vessels - a thrombotic vasculopathy. Scars left after healing. Lesions on foot had coalesced, broken down and ulcerated. Cellulitis developed with MRSA, and treated with Vancomycin. Ulcers eventually healed after 5 months with daily applications of Manuka honey and then neat Vitamin E (D-Alpha-tocopherol). Scars are sensitive and severe neurological pain has occurred at intervals, treated with Ketamine. Smaller groups of lesions, now about 8 years old - all scars and no sensitivity at all. Lesions about 8 years old. Many have coalesced. Some still become inflamed but most are now scars. The white atrophic centres are flaky. 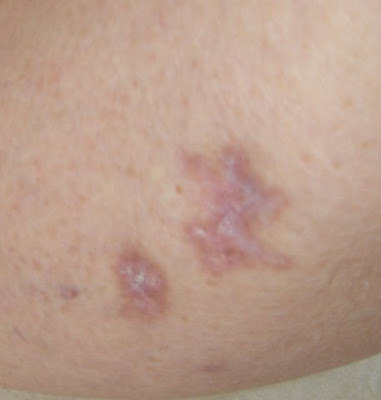 spots (lesions) appear on the skin. They are small and red, slightly raised. The blood vessels affected include those supplying the skin, gastrointestinal tract, and central nervous system. This can result in bowel ischemia (mesenteric ischemia or ischemic colitis), chronic skin lesions, ocular lesions, strokes, spinal lesions, mononeuritis multiplex, epilepsy, headaches or cognitive disorders. Pleural or pericardial effusions are also reported. The outcome of this disease can be fatal with a median survival of 2 to 3 years, although some appear to have a benign form (Degos acanthoma) which affects only the skin. There are fewer than fifty living patients at present known worldwide, and less than 200 reported in the medical literature. Treatment options are limited, consist mainly of Antiplatelet drugs or anticoagulants or immunosuppressants, and effect of treatment is limited to case reports. You will read statistics and numbers which might scare you - but they are often based on projections and on published case reports. There are lots of Degos patients whose cases haven’t been written up and who are alive and well. There are also lots of confident assertions which just aren’t true! For example: “This disease affects mainly young men” - not in our experience! Or “The lesions don’t appear on the soles of the feet” - wrong again! Percentages and actual numbers can’t be right, as no-one has compared living patients until now. Take it all with a pinch of salt and add your experience to our site and to the data being collected in Dessau,Germany. This is a pretty serious disease. I pity those people who have this disease. That is really true and we must look for fast solutions to this problem.